This year 477 students will graduate from Vanguard, a 4% increase from last year. The commencement will be held for the first time at the Pacific Amphitheatre across the street from the university on Saturday, May 8 at 4:30 p.m. 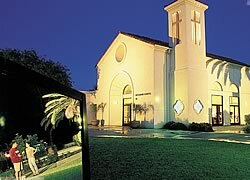 Founded in 1920, Vanguard University of Southern California is a Christian comprehensive university, regionally accredited by the Western Association of Schools and Colleges, and is a member of both the Association of Independent California Colleges and Universities, and the Council for Christian Colleges and Universities. The campus is located in Costa Mesa, off the 55 Freeway at the Fair Drive exit. Founded in 1920, Vanguard University of Southern California (VU) is the largest Christian university in the Pentecostal tradition west of the Rocky Mountains. VU offers 30 majors and concentrations. Also available are opportunities for off-campus study in government in Washington D.C., or in missions and language at the University’s study center in San Jose, Costa Rica. The California campus is ideally located in Orange County where 2,000 nearby corporations provide students with countless jobs and internships. The campus is in Costa Mesa, 50 miles south of Los Angeles, 1 mile from Upper Newport Bay Natural Reserve, and only 5 miles from the Pacific Ocean. During its 80 years, Vanguard University has been a leader in education innovation within the Assemblies of God. In 1939, VU became the first 4-year institution within the fellowship, and in 1964, VU was the first A/G university to receive regional accreditation. Vanguard University is committed to providing an educational experience that integrates faith, learning, and living, while preparing students for a lifetime of learning and service in a variety of careers and ministries. Vanguard believes that a liberal arts education illuminated by Christian truth fosters intellectual and spiritual development that prepares and challenges students to take an active role in their culture and their world.